is working on a computer , work? Whew! this week has been very productive, as far as it looks on paper, or should I say on the internet? I've been spending my "half" days, working on our new website, communicating with students through chat and getting "stuff" done for our Kenya trip. All that to say, when I push my chair back from my desk and get ready for the rest of my day I don't seem to have done anything. Well, anything that I can see, that is. I'm sure you know the feeling. The intangible "things" that we all do everyday. Relational jobs are just like that. We chide youth pastors for not "producing results" when really the results of relational ministries like that, are....relationships. I know more people who work in offices and in cubicles than I know otherwise, so yeah you do probably get what I mean. So, I'm learning to count successful, a day of relationship building and a day full of communication, even if it is online. Our website has taken most of my time, and I'm finding some really cool stuff to rouse the interest of students. First was a link to an article describing how Avatar the movie displays some of the technology we in Bible translation are preparing to use for the translation of sign languages! check it out! 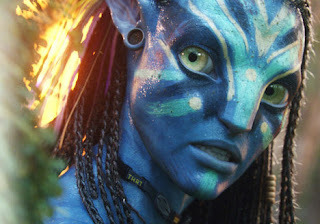 "Avatar and Bible Translation?" Another really fun tool I just found today is a site that allows you to find Bibles and non-written resources in 3,000 languages of the world! I also learned that a partner of ours JAARS, has a great resource called Rev 7, that is published quarterly, to highlight areas of ministry within the Wycliffe partnerships. The recent one was about the work of "Vernacular Media" or "non-written" communications. Fabulous! This is stuff that students can get excited about! So, working from my computer.....I'm learning a lot and getting even more excited about the work of Wycliffe. Who'da known!